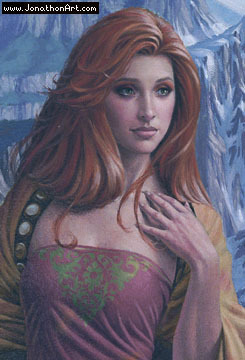 Description: Gwen is a very pretty young girl (age 16) with flowing red gold hair, hazel eyes, and a lithe figure. Originally a barmaid she dressed in cotton blouses and skirts, but since being taken as a apprentice (and his lover) to the Lord Mayor Geildarr she has been dressing in fine gowns of silk and satin. She also wears more jewelry than before. History and Personality: Gwen escaped her village before goblins and demons descended on it destroying it. But while there she worked as a barmaid in her fathers Inn, and helped cover the escapades of her twin brother Glenn (they where notorious pranksters). They traveled to near exhaustion to the near by city of Llorkh where the lord mayor Geildarr (CE male human Wiz7/Dev 3 of Cyric) took interest in their unique link. After tricking the naive Gwen into drinking a love potion he has proceeded to take her as his apprectice and his lover. Though Gwen is aware of some of his more unsavory commands she chooses to ignore his dark side, deciding she can help him. 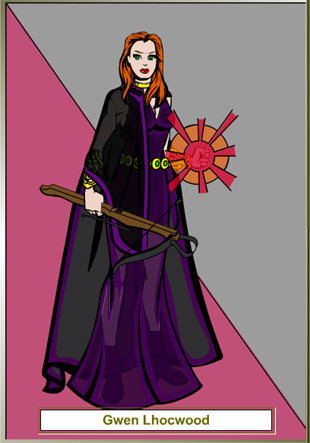 Geildarr enjoys her naive innocence, and uses that to his advantage in keeping her ignorant of his true aims. I would highly recommend looking over his site, some wonderful images.